Gojong (Hangul: 고종; Hanja: 高宗; RR: Gojong; MR: Kojong), the Emperor Gwangmu (Hangul: 광무제; Hanja: 光武帝; RR: Gwangmuje; MR: Kwangmuje; 8 September 1852 – 21 January 1919), was the last king of Joseon and the first Emperor of Korea. Gojong took the Joseon throne in 1863 when still a child. As a minor, his father, the Heungseon Daewongun (or more commonly, the Daewongun), ruled as regent for him until Gojong reached adulthood. During the mid-1860s, the Heungseon Daewongun was the main proponent of isolationism and the instrument of the persecution of native and foreign Catholics, a policy that led directly to the French invasion and the United States expedition to Korea in 1871. The early years of the Daewongun's rule also witnessed a concerted effort to restore the largely dilapidated Gyeongbok Palace, the seat of royal authority. During the Daewongun's reign, Joseon factional politics, the Seowon (learned academies that often doubled as epicenters of factional power), and the power wielded by the Andong Kim clan, completely disappeared as political forces within Korean state life. 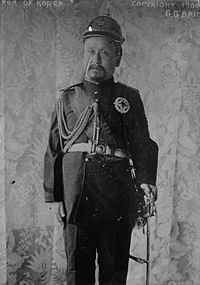 In 1873, Gojong announced his assumption of direct royal rule. In November 1874, with the retirement of the Heungseon Daewongun, Gojong's consort, Queen Min (posthumously known as Empress Myeongseong), gained complete control over the court, filling senior court positions with members of her family. This angered Heungseon Daewongun, who was exiled from the court. Some relatives of Heungseon Daewongun and members of the Southerner faction plotted a coup. In the 19th century tensions mounted between Qing China and Japan, culminating in the First Sino-Japanese War in 1894–1895. Much of this war was fought on the Korean peninsula. Japan, after the Meiji Restoration, had acquired Western military technology and had forced Joseon to sign the Treaty of Ganghwa in 1876. Japan encroached upon Korean territory in search of fish, iron ore, and other natural resources. It also established a strong economic presence in the peninsula, heralding the beginning of Japanese Imperial expansion in East Asia. The French campaign against Korea of 1866, United States expedition to Korea in 1871 and the Incident of the Japanese gunboat Unyo put pressure on many of Joseon's officials, including King Gojong. The Treaty of Ganghwa became the first unequal treaty signed between Korea and a foreign country; it gave extraterritorial rights to Japanese citizens in Korea and forced the Korean government to open three ports, Busan, Incheon and Wonsan, to Japanese and foreign trade. With the signing of its first unequal treaty, Korea became easy prey for many imperialistic powers, and later the treaty led to Korea being annexed by Japan. King Gojong began to rely on a new paid army of rifle-equipped soldiers. The old army, which was primarily armed with swords, spears, and old matchlocks, eventually revolted as a result of their mediocre wages and loss of prestige, and the Heungseon Daewongun was restored to power. 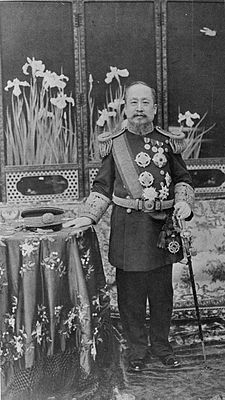 However Chinese troops led by the Qing Chinese general Yuan Shikai soon abducted the Daewongun and took him to China, thus foiling his return to power. Four years later the Daewongun returned to Korea. On 4 December 1884, five revolutionaries initiated the Gapsin Coup, an attempted coup d'état, by leading a small anti-old minister army, attempting to detain King Gojong and Queen Min. The coup failed after 3 days. Some of its leaders, including Kim Okgyun, fled to Japan, and others were executed. Widespread poverty presented significant challenges to the 19th century Joseon Dynasty. One indication of this poverty was the poor conditions of life suffered by those of the lower classes, who often had little to eat and lived in little more than run down shanties lined along roads of dirt and mud. A number of factors, including famine, poverty, high taxes and corruption among the ruling class, led to several notable peasant revolts in the 19th century. King Gojong's predecessors had suppressed an 1811–1812 revolt in the Pyeongan Province, led by Hong Gyeong-nae. In 1894, another major revolt, the Donghak Peasant Revolution took hold as an anti-government, anti-yangban and anti-foreign campaign. To suppress the rebellion, the Joseon government requested military aid from Japan, thus deepening Japanese claims to Korea as a protectorate. In the end the revolution failed, but many of the peasants' grievances were later dealt with by the Gabo Reform. In 1895, Empress Myeongseong, also known as Queen Min, was assassinated by Japanese agents. The Japanese minister to Korea, Miura Gorō orchestrated the plot against her. A group of Japanese agents entered the Gyeongbokgung in Seoul, which was under guard by Korean troops sympathetic to the Japanese, and the Queen was killed in the palace. The Queen had attempted to counter Japanese interference in Korea and was considering turning to Russia or China for support. By 1895 Japan had won the First Sino-Japanese War, gaining much more influence over the Korean government. The Gabo reforms and the assassination of the Queen also stirred controversy in Korea, fomenting Korean anti-Japanese sentiments. Some Confucian scholars, as well as farmers, formed over 60 successive righteous armies to fight for Korean freedom. These armies were preceded by the Donghak movement and succeeded by various Korean independence movements. On 11 February 1896, King Gojong and his crown prince fled from the Gyeongbokgung to the Russian legation in Seoul, from which they governed for about one year, an event known as Korea royal refuge at the Russian legation. In 1897, King Gojong, yielding to rising pressure from overseas and the demands of the Independence Association-led public opinion, returned to Gyeongungung (modern-day Deoksugung). There he proclaimed the founding of the Empire of Korea, officially redesignated the national title as such, and declared a new era name Gwangmu (Hangul: 광무, Hanja: 光武) (meaning, "shining and martial"). 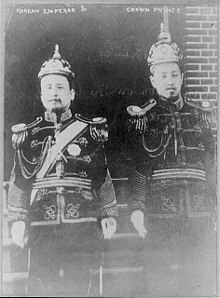 This effectively ended Korea's historic subordination to the Qing empire which Korea had acknowledged since the fall of the Ming Dynasty, King Gojong took the title of Gwangmu Emperor, and became the first imperial head of state and hereditary sovereign of the Empire of Korea. This marked the end of the traditional Chinese tributary system in the Far East. Adopting the status of Empire meant that Korea was declaring itself the co-equal of Qing China, that it was independent of it and, at least nominally, it implemented the "full and complete" independence of Korea as recognized in 1895. Gojong proclaimed the Korean Empire in October 1897 to justify the country's ending of its traditional tributary subordination to China. He tried to promote the ultimately unsuccessful Gwangmu Reform. In 1904-5, the Japanese military achieved a comprehensive victory in the Russo-Japanese War. Following the Protectorate Treaty of 1905 between Korea and Japan, which stripped Korea of its rights as an independent nation, Gojong sent representatives to the Hague Peace Convention of 1907 in order to try to re-assert his sovereignty over Korea. Although the Korean representatives were blocked by the Japanese delegates, they did not give up, and later held interviews with newspapers. One representative warned forebodingly of Japanese ambitions in Asia: "The United States does not realize what Japan's policy in the Far East is and what it portends for the American people. The Japanese adopted a policy that in the end will give her complete control over commerce and industry in the Far East. Japan is bitter against the United States and against Great Britain. If the United States does not watch Japan closely she will force the Americans and the English out of the Far East." As a result, Gojong was forced to abdicate by the Japanese and Gojong's son Sunjong succeeded to the throne. And after Sunjong, the kingdom of Joseon ended. Gojong wearing western-style uniform (korean:태황제 예복, hanja:太皇帝 禮服). He wore it since the abdication of 1907. After abdicating, Emperor Gojong was confined to the Deoksu Palace by the Japanese. On 22 August 1910, the Empire of Korea was annexed by Japan under the Japan-Korea Annexation Treaty. 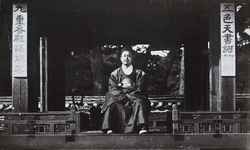 Gojong died suddenly on 21 January 1919 at Deoksugung Palace at the age of 66. There is much speculation that he was killed by poison administered by Japanese officials, an idea that gained wide circulation and acceptance at the time of his death. His death and subsequent funeral proved a catalyst for the March First Movement for Korean independence from Japanese rule. He is buried with his wife at the imperial tomb of Hongneung (홍릉, 洪陵) in the city of Namyangju. His Imperial Majesty The Emperor Emeritus of Korea (大韓帝國太皇帝陛下 대한제국태황제폐하 Daehan Jeguk Taehwangje Pyeha) (1907–1910), after his forced abdication by the Japanese government. 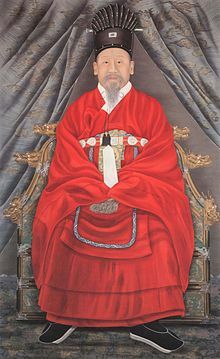 His Royal Highness The King Emeritus Yi of Korea (德壽宮李太王殿下 덕수궁이태왕전하 Deoksugung Yi Taewang Jeonha) (1910–1919), a demoted title given by the Japanese government on the annexation of Korea, ignored in Korea. Portrayed by Lee Jin-woo and Lee Joon in the 2001-2002 KBS2 TV series Empress Myeongseong. Portrayed by Kim Young-min in the 2009 film The Sword with No Name. Portrayed by Choi Jong-hwan in the 2010 SBS TV series Jejungwon. Portrayed by Park Hee-soon in the 2012 film Gabi. Portrayed by Lee Min-woo in the 2014 KBS2 TV series Gunman in Joseon. Portrayed by Baek Yoon-sik in the 2016 film The Last Princess. Portrayed by Lee Seung-joon in the 2018 TV drama series Mr. Sunshine. This page is based on the Wikipedia article Gojong of Korea; it is used under the Creative Commons Attribution-ShareAlike 3.0 Unported License (CC-BY-SA). You may redistribute it, verbatim or modified, providing that you comply with the terms of the CC-BY-SA.